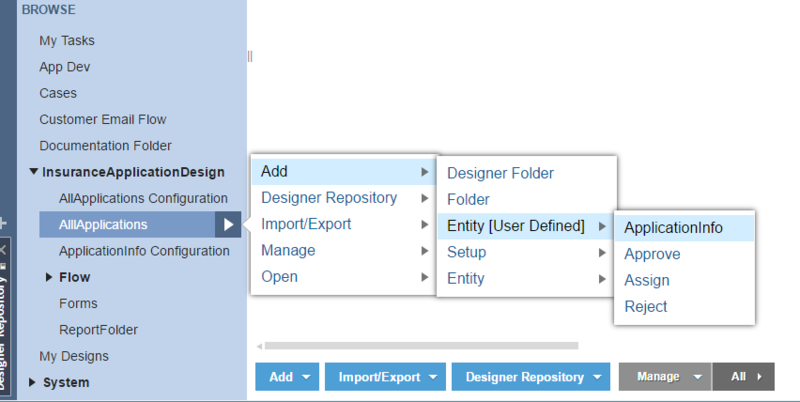 A folder entity can have validation applied, set up in the form of rules or a flow created by the entity&apos;s action folder. Setting up validation rules is particularly useful if the Action menu is to be used to manually add an entity rather than creating the entity by executing a flow. 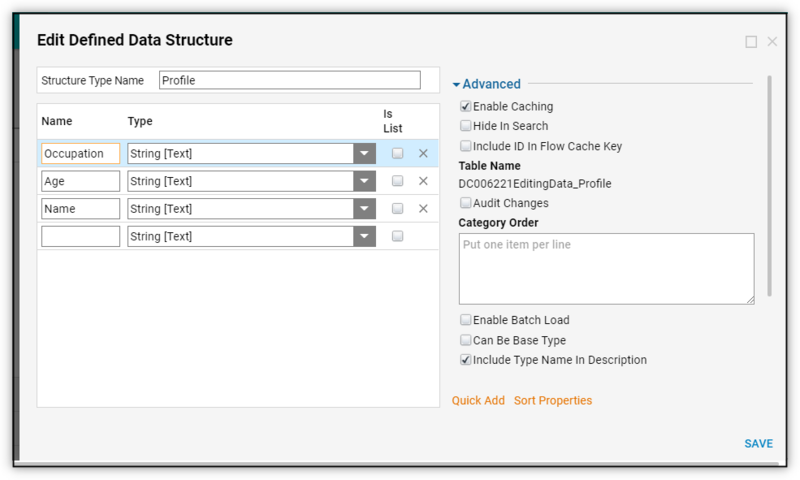 You can emulate the rules set up in a flow that creates the same entity, for example, using the Advanced	validation Rule	, Validation Flow	, andValidation Rule	validation options. 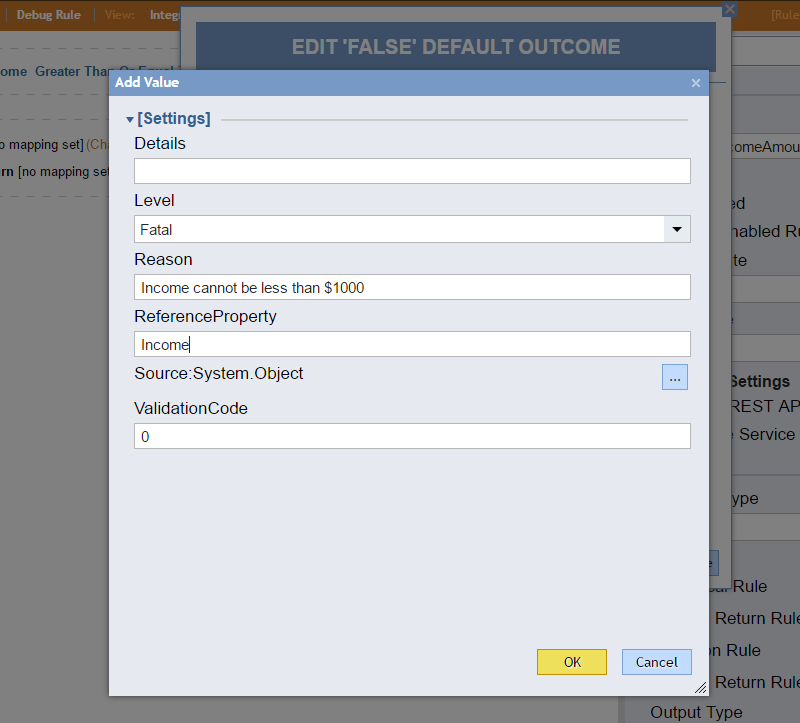 Validation Rule	- By default set to a logical rule, this rule enforces a true/false evaluation when creating an entity. 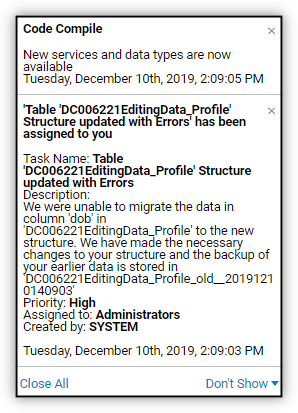 Advanced Validation Rule	- By default set to data return rule, returning data of type ValidationIssue . You can get more sophisticated in your validation using this type; for example, using either Warn or Fatal error level and providing a custom error message. Validation Flow	- A flow is used to enforce validation. For example, a database lookup to see if the vendor exists in the corporate "vendors" database before submitting a bid for a project. 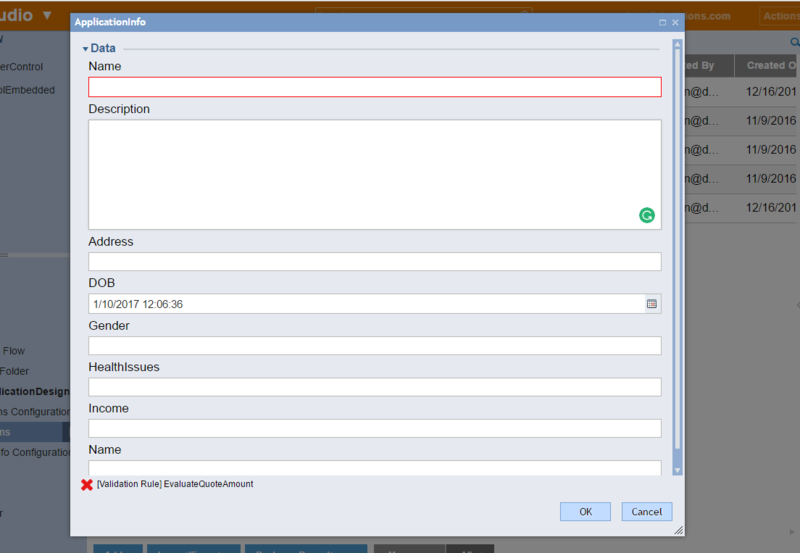 The only existing validation on the Add ApplicationInfo screen is for requiring EntityName. A simple rule will be added to enforce a minimum quote amount of $1,000. Browse to the actions folder for the entity, which in this example, is underInsurance Application Design> ApplicationInfo > Entity Actions	. 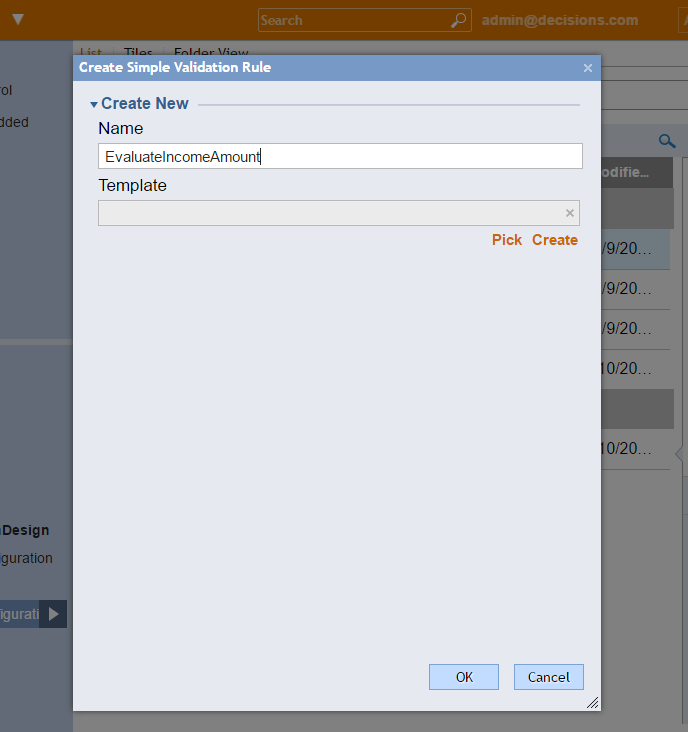 Click on Validation Rule > Validation Rule	. Name the rule and click OK	.
By default, the rule input data is set to the entity, therefore it is not necessary to specify input data for the rule to evaluate in this example. (However you should want to evaluate additional data and factor that into the decision-making.) In the Start Rule	window, click Add New Rule Step	. 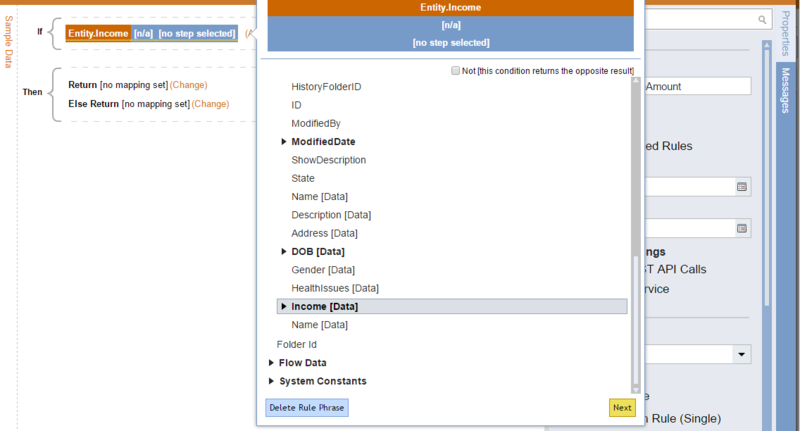 Expand Entity	and select Income[Data]	. Click Next	. 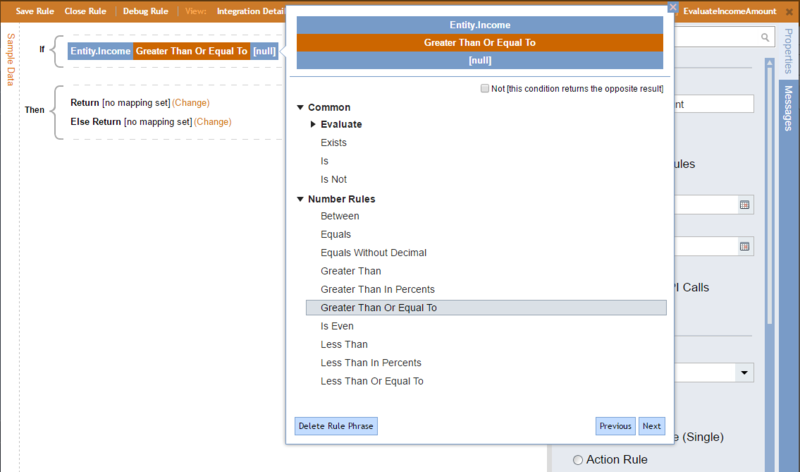 Expand Number Rules	and select Greater Than Or Equal To	, and click Next	. Lastly, type 1000 in the Value	field and click Done	. Save and close the rule. Back in the portal, navigate to a folder that has the entity action for adding the entity for which the rule was established. Click the Add option for the entity. Notice at the bottom the new validation for Quote Amount. The entity cannot be added until the rule evaluates true, therefore enforcing the minimum dollar amount. The only existing validation on the AllApplications screen is for requiring EntityName. A simple rule will be added to enforce a minimum quote amount of $1,000. Browse to the actions folder for the entity, which in this example, is under Insurance Application Design > Application Configuration. 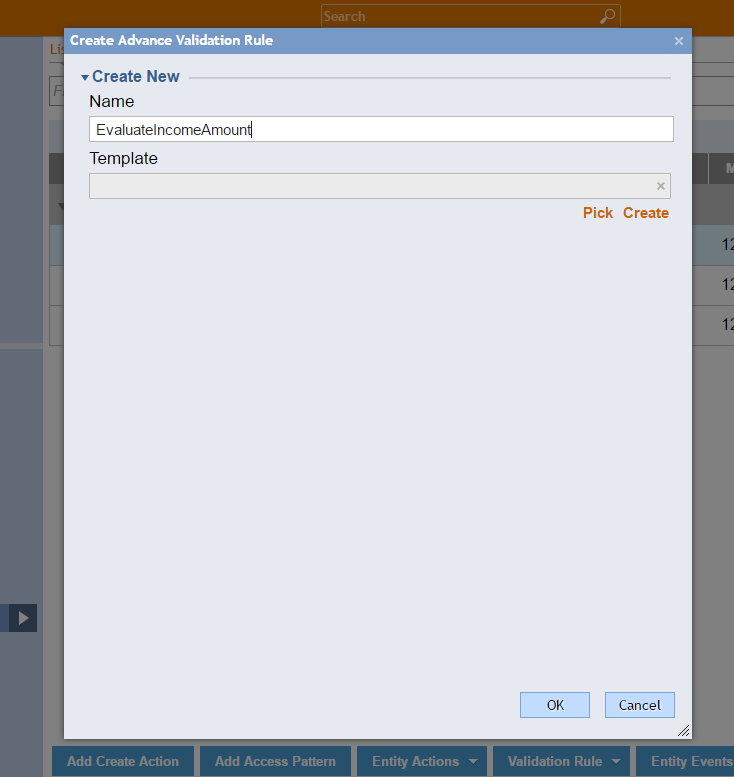 Click on Validation Rule > Advanced Validation Rule	. In the Start Rule	window, selectAdd New Rule Step	. 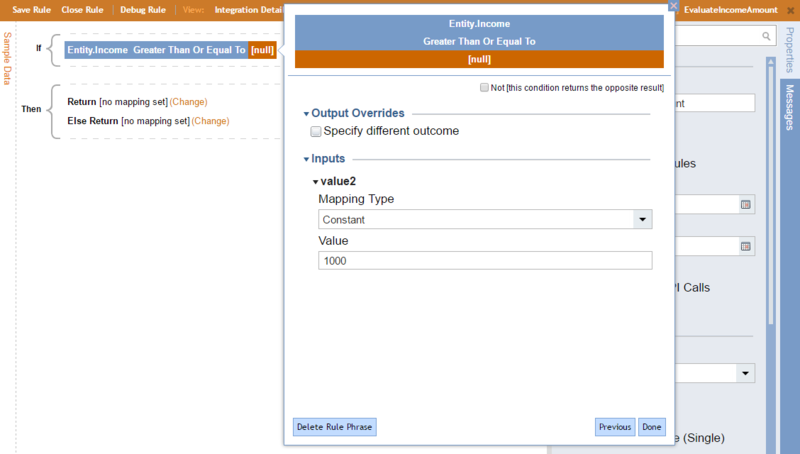 Expand Entity	and select Income	. Click Next	. Details - Can be left blank, and is simply a description field for the rule entity. Level - Either Warn	or Fatal	, Warn	would alert the user but allow the action on the entity to proceed. Fatal	does not let the action proceed until the rule evaluates true. Reason - This is the message that appears to the user after the rule is evaluated. Reference Property - This is the name of the Entity. [property] being evaluated. Source - Can be left blank; by default, this is a System.Object. This field is relevant if there were editable properties of the object. Leave Then > Return	mapping value Null	, since we do not need to take action for when the rule evaluates true. Notice the new validation for Quote Amount. The entity cannot be added until the rule evaluates true, therefore enforcing the minimum dollar amount. 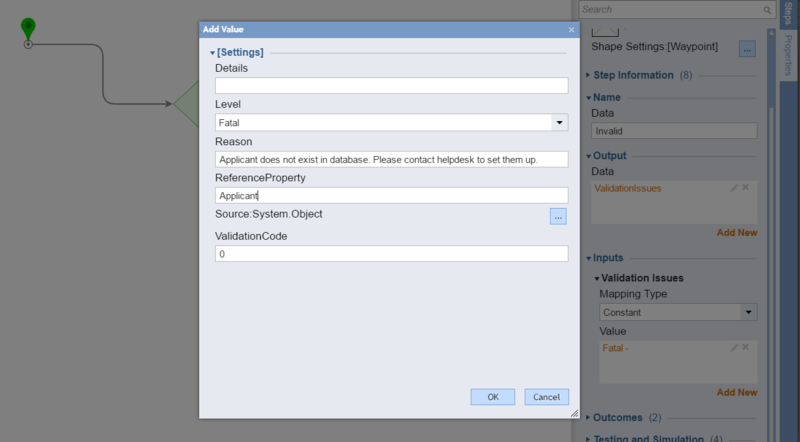 In this example, a validation flow is used to see if the vendor exists in the company database. If not, the vendor is not permitted to provide a quote. 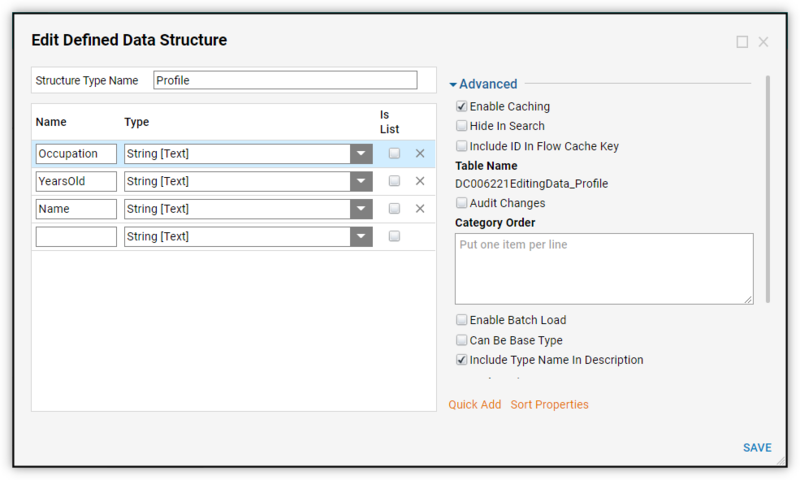 Placeholder components are used in the flow to simulate the database lookup. Browse to the actions folder for the entity, which in this example, is under Insurance Application Design> ApplicationInfo Configuration	. 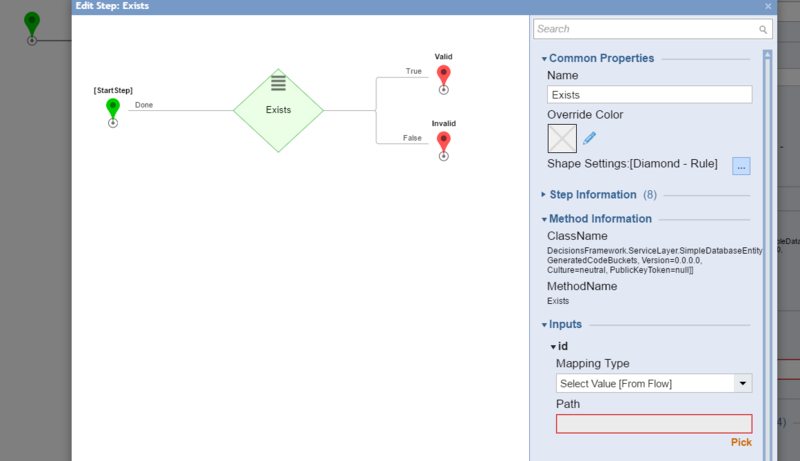 Click on Validation Rule > Validation Flow	. The Done	path represents the existence of an applicant and is therefore connected to the Valid	path. The validation on the entity will pass when this path it takes. The Failed	path represents the applicant does not exist in the database. Therefore it is connected to the Invalid	end step. Click on the Invalid	step. Notice the Output data by default is ValidationIssues . This completes the validation flow. When the entity is added or edited, the validation flow will execute and perform a lookup for the applicant and produce a fatal warning if the applicant is not found.